Trutta employs traditional and/or HDSS approaches in sampling water quality. The traditional approach deploys spot samplers to specific locations to collect bottled samples for later analysis in a testing laboratory. 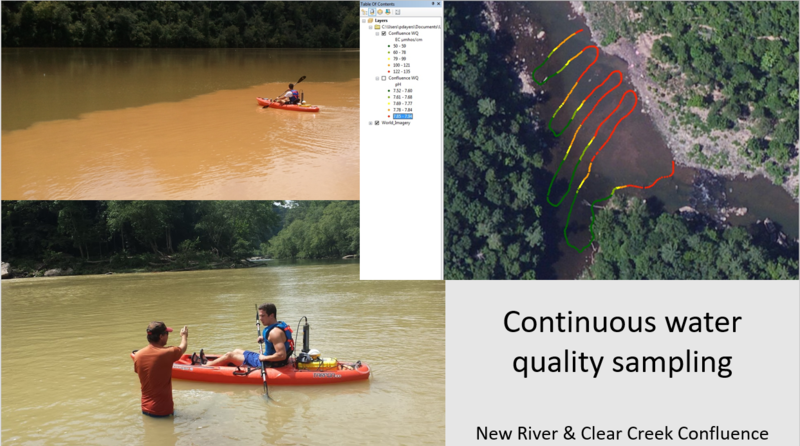 As depicted in Figure 1, Trutta uses the HDSS method to tie water quality to visual stream features, both above and below the water, over an entire survey. Figure 1. Dr. Paul Ayers of the University of Tennessee and student testing continuous water quality sampling at the confluence of the New River and Clear Creek, TN. The plot of water conductivity shows a marked difference in conductivity coming from the different water sources. Figure 2. A water quality example from Falling Water River, TN. The specific conductivity of the water increases downstream of the confluence with Pigeon Roost Creek. Upstream on Pigeon Roost Creek is the Cookeville water treatment facility. The red dots of low conductivity are the result of us pulling the kayaks over large log jams and the sensor being out of the water. 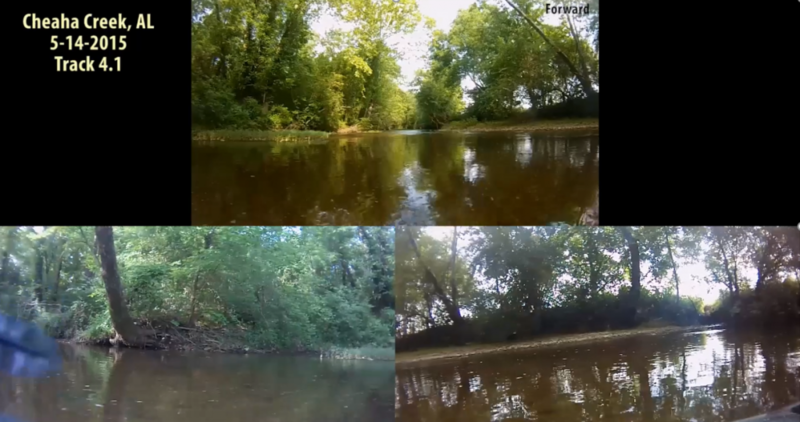 Combining the water quality results with the HDSS video allows anomalies such as these to be easily understood. 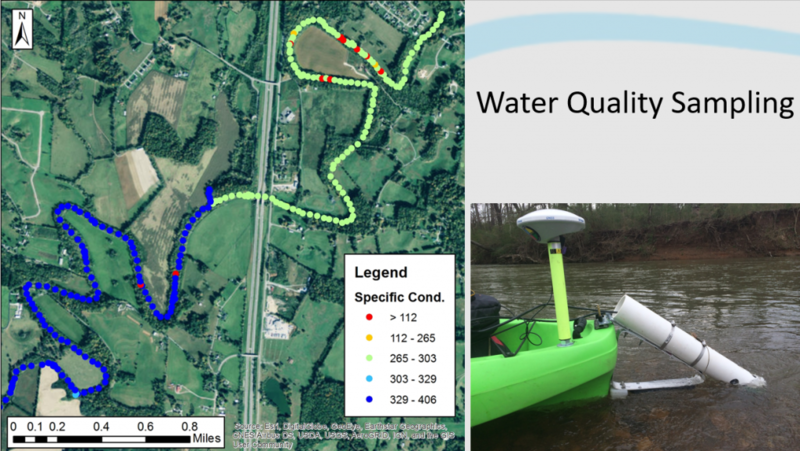 Trutta’s HDSS methodology provides not only a much more thorough analysis of water quality (100% of the survey area, not randomly selected or just easily accessible spots), but also enables root cause analysis of water quality issues throughout a stream system. In short, HDSS can reveal changes in water quality that would likely not be revealed by relying on traditional sampling methods. For example, the algae blooms in Figure 4 below are an indication of too much nutrient runoff, as compared to healthy conditions just upstream (Figure 3). Traditional water quality samples taken short distances above or below this algae bloom would miss the fact that a dry swale (Figure 3, bottom right ) is obviously washing nutrients into the stream at high flow. 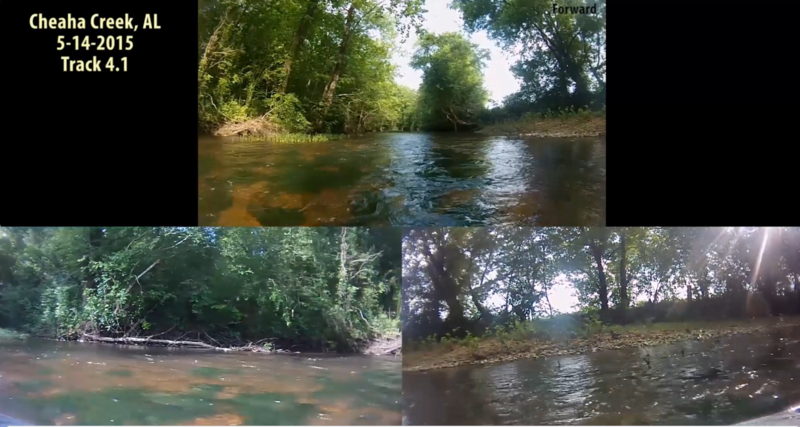 Bottom line: better information provided by HDSS methods make it much easier and faster to identify areas where Best Management Practices (BMPs) can and should be applied to enhance stream health. Figure 3. Dry swale on right side streambank entering an algae-free stream segment. Figure 4. Just downstream of Figure 3. A bloom of filamentous algae is observed on the stream bottom.